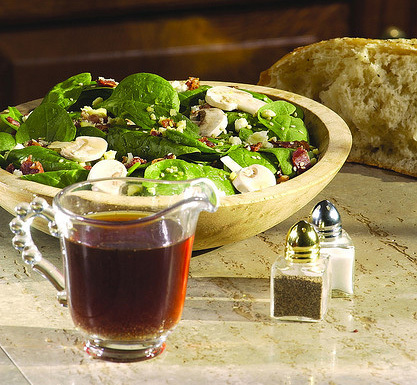 Remove stems from spinach and toss with mushrooms in a serving bowl. Chop egg & crumble bacon. Toss with the spinach. Stir maple syrup & vinegar together. Add salt & pepper. Heat until warm in a saucepan. Sprinkle sesame seeds over the spinach. Pour maple syrup over spinach and toss.